My dad was a professional baker, as was his dad before him. My brother baked with Dad from the time he was old enough to hold a rolling pin in his chubby little toddler hands. He has worked in the baking industry his entire life, and still does. My sister Jen says she can’t bake a lick, though I’m not entirely sure that is true. My sister Bec is the one in our family who we count on when we want baked items at our family gatherings. Bundt cakes and brownies are her specialties. Ask Bill, who enjoys the fruits of her labors. As for me, I absolutely LOVE to bake. However, for the most part, I stink at it. There you have it. My name’s Kris, and I’m a Horrible-Baker-Who-Should-Be-Better-Because-My-Dad-Owned-A-Bakery. Maybe there’s a support group. So, now that I’ve given you background, let me tell you a story. The other day I got a hankering for biscotti. You know, those hard cookies that you dunk in coffee or tea, or if you’re in Italy, maybe Vino Santo after a wonderful dinner al fresco. My favorite biscotti recipe comes from Giada di Laurentis, but they contain pistachios (yum) and dried cherries or cranberries. Though I shouldn’t eat the dried fruit, I could possibly let that slide; however, the pistachios are a firm no-go on my low fiber diet, no matter how delicious they are. So I got the notion to bake chocolate biscotti. I knew Bill would be happy, and I was confident I could find a recipe for chocolate biscotti without nuts. 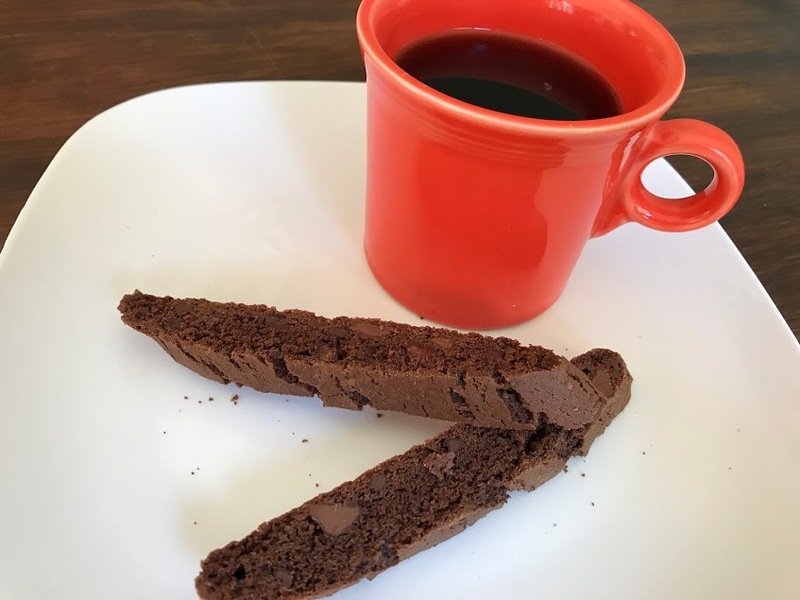 And so I did, Double Chocolate Biscotti from Once Upon a Chef blog. Biscotti are not terribly hard to make. The trick is that you mix the dough, form it into a log, and bake it for a half hour or so. You then remove the baked dough from the oven and slice them into the familiar biscotti shape. Then, bake them again for 10 minutes or so, until they sort of dry out and become hard. The reason I’m a sort of hit-or-miss baker is because I’m sloppy and apparently quite forgetful. I’ve always been sloppy; I grow more and more forgetful as I grow older. So, using my beloved Kitchen Aid mixer, I mixed the ingredients, all of which, surprisingly, were in my pantry. I took the sticky dough and formed it into two carefully shaped logs. I was about to put them in the preheated oven when the guardian angel in charge of food preparation landed on my shoulder and said, “You forgot to put in the chocolate chips, Stupid.” Who knew angels used such hurtful language? So here was my conundrum. The logs were beautiful, glistening with chocolaty goodness. 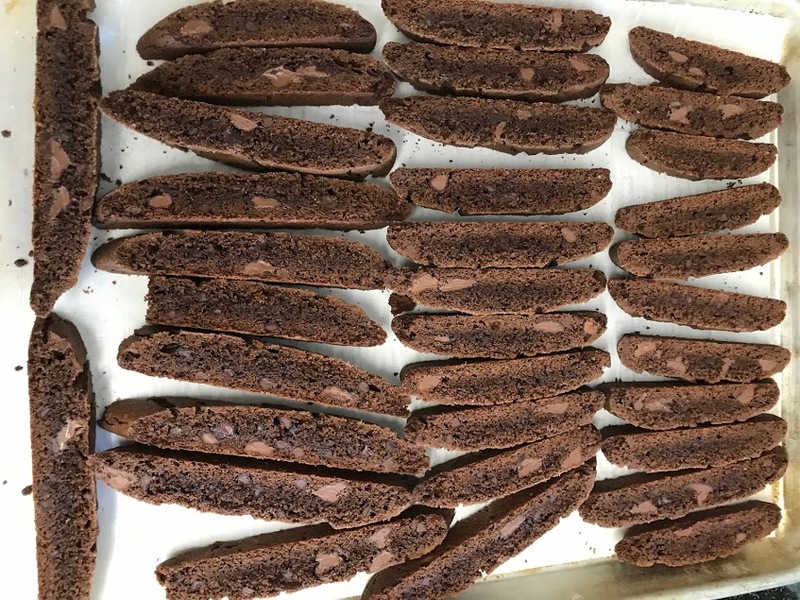 As I saw it, these were my two choices: 1) Dismantle the logs and put the dough back in the Kitchen Aid mixer, add the chocolate chips, and re-form into new logs; or 2) Change the name from Double Chocolate Biscotti to simply Chocolate Biscotti and don’t do a damn thing…..
As you will see from the photo, I chose the former solution. I just could picture Bill’s face when he bit into a soft chocolate chip in his cookie. These are doubly chocolaty delicious, he was bound to say…..
Preheat oven to 350 degrees and line a baking sheet with parchment paper. In a medium bowl, whisk together the flour, cocoa powder, baking soda, and salt. In the bowl of an electric mixer, cream the butter and sugar until fluffy. Add the eggs, one at a time, mixing well after each egg and scraping bowl with a spatula. Add the vanilla. Then add the dry ingredients and chocolate chips and mix on low speed until just combined. Dust a work surface with flour. Scrape the sticky dough out onto the work surface and dust the top of the dough to make it workable. Shape the dough into a ball and cut in half. Form each half into a log, and place on the parchment-lined cookie sheet. Shape into longer logs about ¾ in. high and 2 in. wide. Allow enough space for the logs to spread a bit while they bake. Bake for about 35 minutes, until firm to the touch. Let the biscotti logs cool on the pan for about 5 minutes. Carefully remove logs onto a cutting board. Using a serrated knife, slice the logs on the diagonal into ¾ in. slices. Don’t worry if they crumble a bit. Put the cookies back onto the cookie sheet on their sides (cut sides down), and place back in the oven for 10 minutes to dry and harden. Cool on the pan for a few minutes; then transfer to a cooling rack until completely cool. I’m an early riser. It’s unheard of for me to sleep until 7; it’s not uncommon for me to get up around 5:30. However, yesterday morning, I awoke bright and early at 4:45, and talked myself into staying in bed until 5, when I finally heard the birds awakening. I posted my blog and then went downstairs to fix coffee and open the windows to let in the cool morning air. I was settling down for my first cup of coffee when I suddenly had a hankering for a crumb-topped muffin. I started trying to figure out where I could buy one, and then reminded myself that I have all of the necessary ingredients to make them myself. Which is what I proceeded to do. I preheated the oven to the necessary temperature, and was just putting the crumbly topping onto my muffins when suddenly there was a click and the sound of electronic equipment sighing, and the house went dark and silent. The electricity had gone off. Since Bill has been doing demolition and rebuilding in the family room, it certainly wasn’t out of the realm of possibilities that he might have done something that resulted in our house losing electricity. But since he was upstairs (I had just heard the sound of him walking around and getting ready to come downstairs) I gave him a pass, figuring that the entire neighborhood was probably without power. Thankfully, it was almost 6 by this time, and the rooms were sufficiently light, if really, really quiet. Nevertheless, I suddenly felt like Ma Ingalls in Little House on the Prairie. Except I wasn’t worried about angry Indians or rabid wolves attacking me. I called my next-door neighbor to confirm that it was the entire neighborhood that was part of the powerless prairie. Doesn’t it just feel weird, she asked me. And it did. She had called the power company and was told that the power would be back on by 9:30 at the latest. The first thing I did upon hanging up was to save the coffee by putting it in a thermos pot. (That’s kind of Little House on the Prairie-ish, don’t you think?) But if you have coffee, you can handle almost everything. This theory was born out when I heard a knock on my door a bit later and our neighbor from across the street had awakened to no electricity. And I don’t even have a cup of coffee, she whined. Our coffee was gone by that time, so I commiserated and she returned to her powerless house empty-handed. You don’t really understand just how much we rely upon electricity. Bill was forced to read the junk notices we had put into our recycling bin the night before for entertainment since he reads all his news from the internet on his iPad. I kept promising things I couldn’t actually produce. How about a piece of toast with peanut butter, I asked. Except then I realized my toaster won’t work. Maybe I could drive over and get some bagels for breakfast, I said. Except then I remembered that our garage door is electric. Actually, Bill was able to release some sort of lever or other and get our garage door to open manually, which was good because he had someplace he had to be at 8 o’clock. Pa Ingalls would have just taken the donkey cart. Even though I had no place to go, it made me feel better. At least I could go get some toilet paper if necessary. One always feels the need to buy toilet paper in an emergency. That’s why it’s the first thing to go when blizzard-shopping. The electricity finally popped back on around 9:15. The first thing I did was to preheat my oven once again and bake some crumb muffins. They were even better for having to wait. And I again appreciated my 21st century conveniences. Preheat oven to 375 degrees. 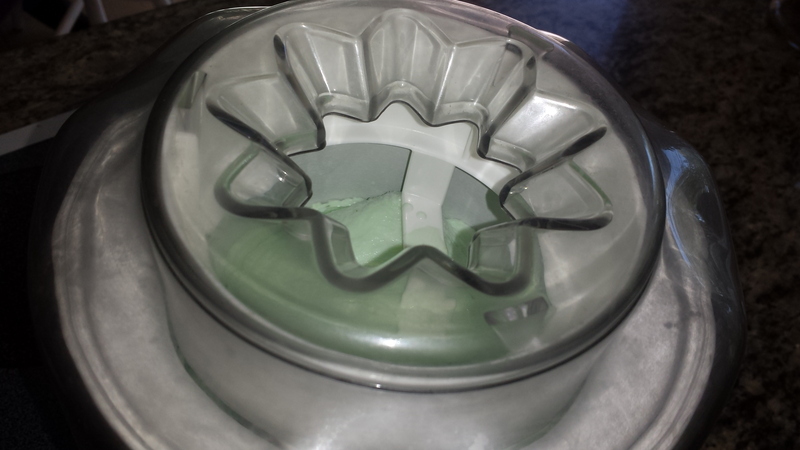 Line a 12-cup muffin tin with liners, or spray with cooking spray. Make crumb topping: Combine sugar, cinnamon, and salt. Slowly pour in melted butter and mix. Add flour and stir until moist. Spread on plate or parchment paper to dry. In a large bowl, combine flour, sugar, baking powder, cinnamon, baking soda, and salt. In another large bowl or measuring cup, mix milk, canola oil, and egg. Pour wet mixture over dry ingredients and stir until moist. 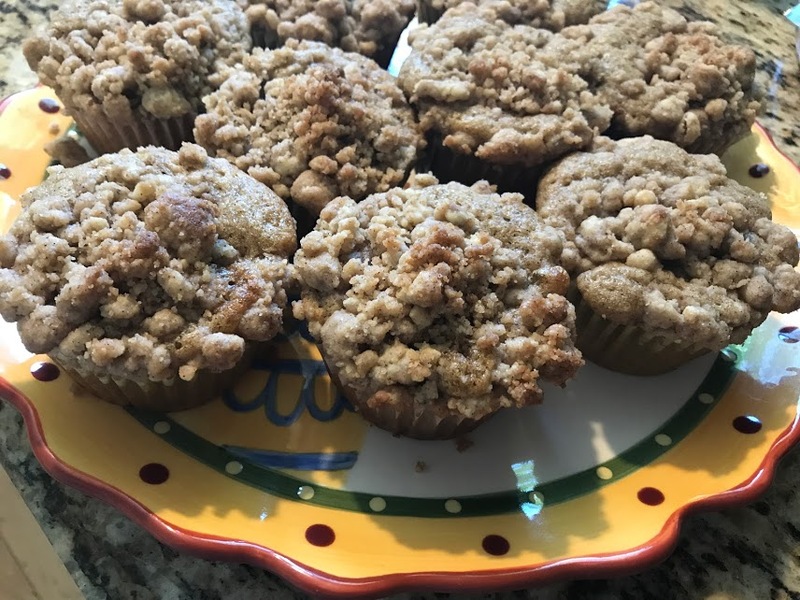 Fill muffin tins and top with crumb topping. Bake for 15 – 17 minutes, or until toothpick inserted comes out clean. When I was in middle school and high school, I was a tremendous athlete. I was the captain of our volleyball team. I was the starting pitcher for the girls’ softball team. I still hold the Nebraska girls’ record for pole vaulting. I didn’t play a single sport. Not a one. It wasn’t entirely my fault. At my high school in the 60s and 70s, there were no athletic options for girls. None. Zero. Zip. There are now, but in those days, if you weren’t a cheerleader, you got no school-sponsored exercise beyond gym class. And then most of the exercise in gym class came from attempting to outrun the gym teacher so that you didn’t have to take a shower which would require taking off your clothes in front of others. In my case, it didn’t make a lick of difference because I likely wouldn’t have played any sports even if I’d had the option. I’m just not very athletic. Though my siblings and I all love many sports, and eagerly watched our kids and now watch our grandkids in all sorts of athletic activities, it’s safe to say that Mom and Dad weren’t troubled by too many letters of intent to any colleges for any of us. 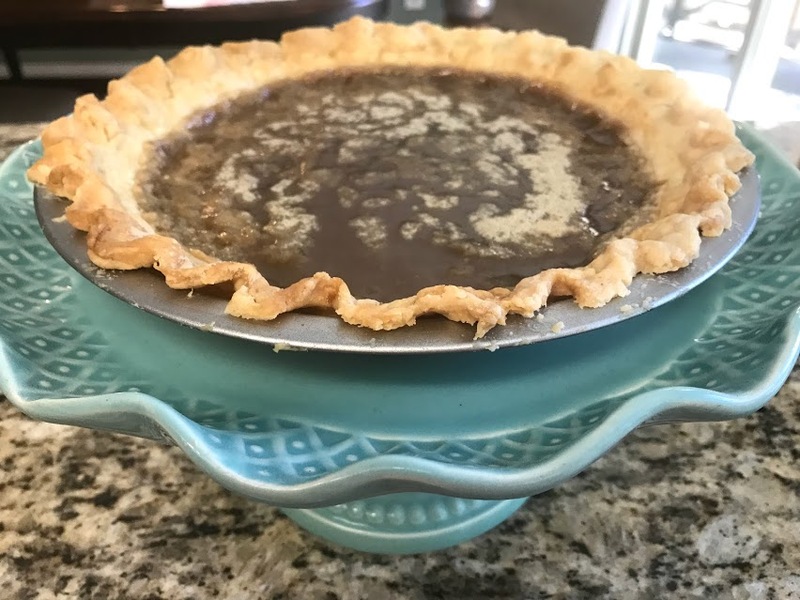 Late last week, Addie texted me and asked if she could come over and do a test run on making crème brulee, something she wants to serve at her upcoming dinner party. Yes, you are recalling right. 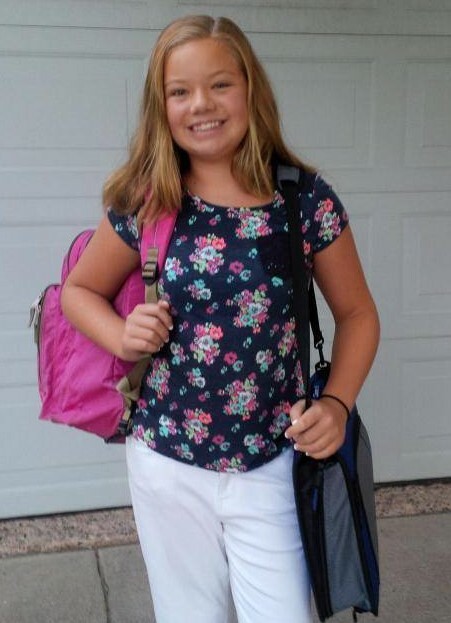 Addie is 13. But she has a yearly dinner party for which she prepares all of her food. Anyway, I agreed to help her with the crème brulee test run on Saturday. 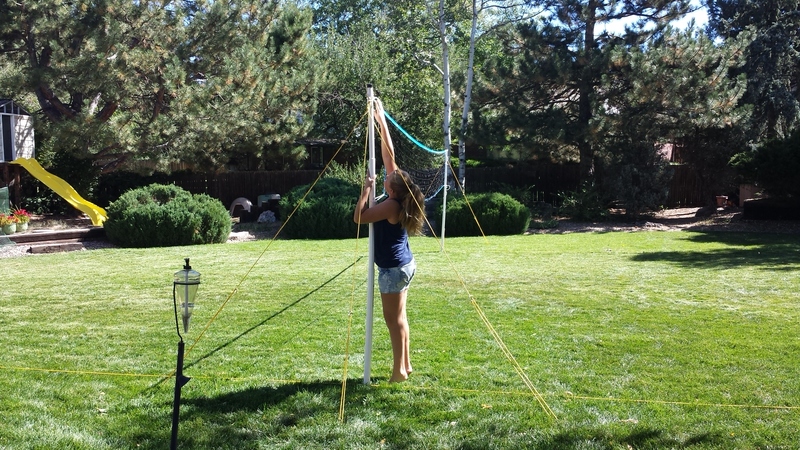 And then she texted me a bit later and asked if it would be okay to set up the volleyball net in our back yard and invite two or three of her girlfriends over to play volleyball, as volleyball tryouts are being held Tuesday and Thursday. Yep, I assured her. That would be just fine. 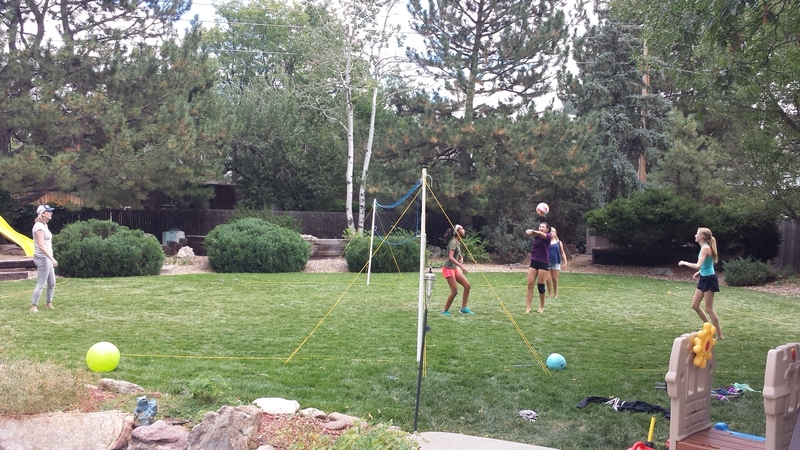 And then, of course, Bill got to work making our backyard look like an Olympic volleyball court. He mowed an area the appropriate size. He laid down a rope to indicate boundaries. He trimmed the nearby tree. I was waiting for the truck to pull up and dump a load of sand. I love my husband. Just before the girls were scheduled to arrive, I left for a quick trip to the grocery store. When I returned, my vision of some girls tossing a volleyball around and giggling was put to rest. Addie had set up a full-out volleyball clinic, including a coach. Now, to be fair, the coach is the mother of one of the girls, but she had played volleyball in school, and was very good and very knowledgeable. It was serious business, my friends. If those girls don’t make the team, it will be through no fault of either Addie, Bill, or me. Back to my area of expertise, which is certainly not volleyball. 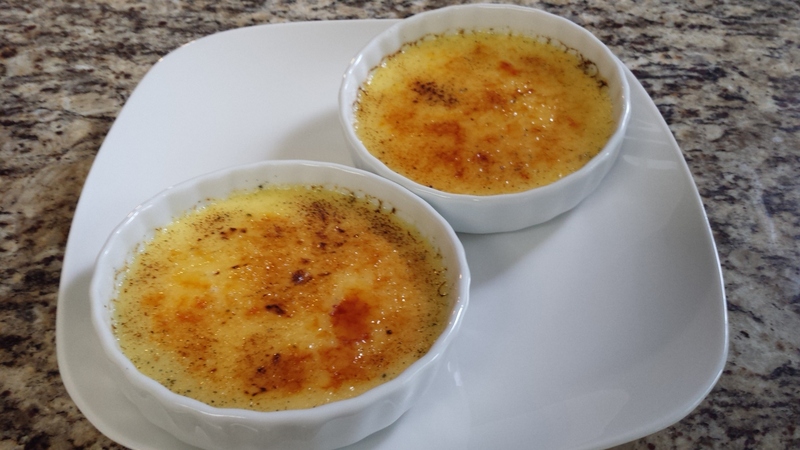 Crème Brulee. 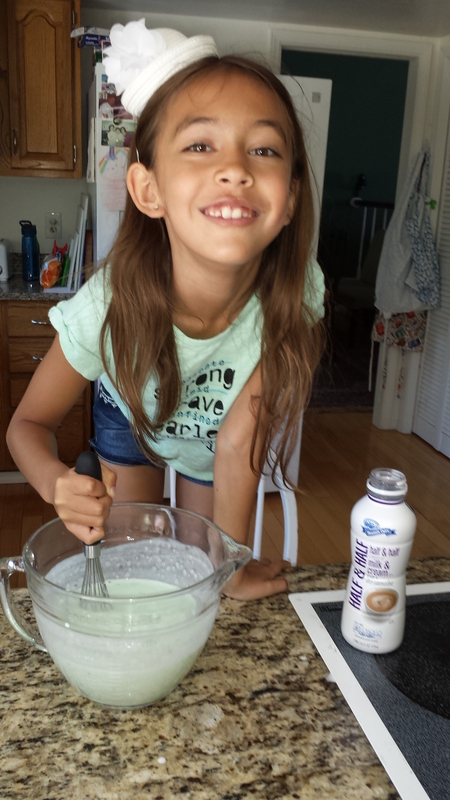 Addie and I spent the morning making the crème brulee. And they turned out perfectly…. 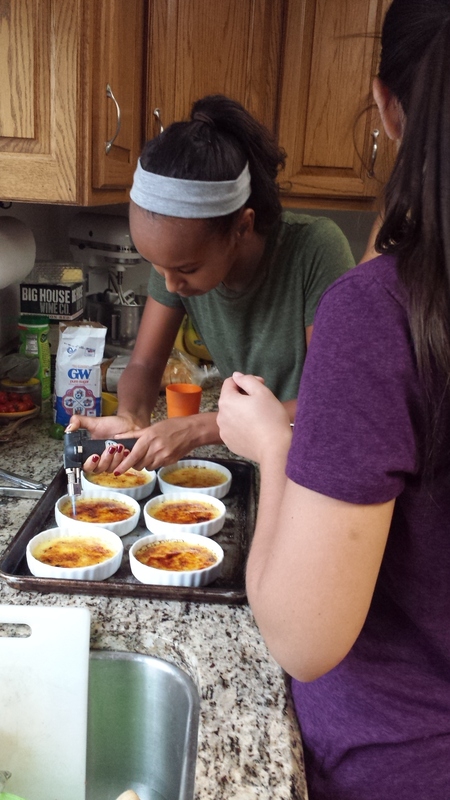 Once the girls took a break from volleyball, they came inside and took a turn at using my rarely-used kitchen propane torch and burning the sugar on their individual desserts…. I will leave you with the recipe for crème brulee, but not the recipe for successful volleyball skills. You’ll have to ask Addie. Place the cream, vanilla bean and its pulp into a saucepan over medium-high heat. Bring it to a boil, stirring constantly to prevent burning. Once it reaches temperature, remove it immediately from the heat. Cover and let it sit 15 min. to cool. Remove the vanilla bean. In a medium bowl, whisk together ½ c. sugar and the egg yolks until the mixture just starts to lighten in color. Then add the cream A LITTLE AT A TIME, stirring continually. If you add the hot mixture too quickly, the egg mixture will scramble. 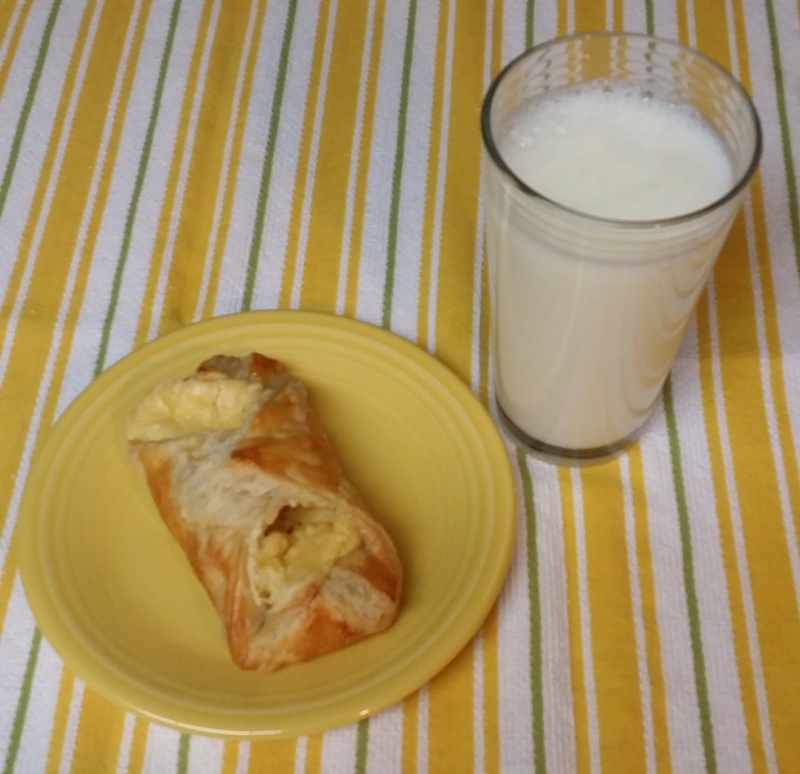 Once combined, pour the custard into 6 (7-8 oz.) ramekins. Place the ramekins onto a large sheet pan or roasting pan. Pour enough hot water into the pan to come halfway up the sides of the ramekins. Bake just until the custard is set but still shaky in the center, about 40-45 minutes. Remove the ramekins from the pan and refrigerate for at least 2 hours, or up to 3 days. When ready to serve, remove the ramekins from the refrigerator and allow 30 minutes to come to room temperature. Using the remaining sugar, spread evenly over the custard. Then, using a kitchen torch, melt the sugar and form a crispy crust. Allow to rest for at least 5 minutes before serving. Nana’s Notes: I assure you, the crème brulee did not rest 5 minutes before the girls dug in. From the sounds of delight, they must have been good. The first thing I want to say is I think that the entire world misspells the word sherbet. I pronounce it sher-bert. Always have. Always will. So that’s how it should be spelled. But it isn’t. It’s kind of like the town in Nebraska – not far from where I grew up – called Norfolk. Now, if you are from Norfolk, VA, you pronounce it Nu-fuuk. Or something like that. But if you live in central or eastern Nebraska, you pronounce it Nor-fork, despite the fact that there is only one “R” in the word. Nebraskans, however, aren’t just being contrary. The name of the town originated from the fact that it is near the north fork of the Elkhorn River, but it became misspelled somewhere along the way. I don’t know if something similar happened to sherbet, or if perhaps I’m the only one in the world who pronounces it sher-bert. But the bottom line is, it doesn’t really matter. Because no matter how it’s spelled or pronounced, I was bound and determined to make lime sherbet with Kaiya and Mylee yesterday. I am a big fan of sherbet. Orange sherbet is my favorite, and if you really want to send me over the moon, give me a dreamsicle. When my father and mother owned the bakery in Columbus, they had an ice cream freezer from which they offered sweet treats. Ice cream bars, fudgesicles, ice cream sandwiches, ice cream drumsticks. I loved being able to enjoy an ice cream treat after school or on a Saturday afternoon. And my choice? Almost every time? Dreamsicles. 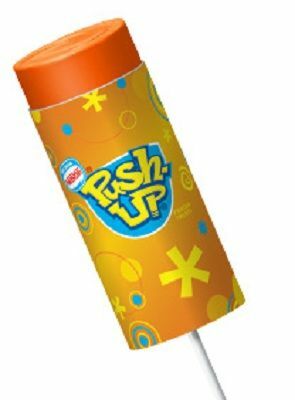 Well, to be honest, they were really orange push-ups. There was orange sherbet on the top and creamy vanilla ice cream on the bottom. Heaven on a stick. I think that Kaiya looks like Princess Kate in her Fascinator. During the summer, our neighborhood Good Times offers a frozen custard flavor of the month, and on several occasions, that flavor has been dreamsicle. I would be embarrassed to tell you how often I will drive through and sneak a cup of dreamsicle frozen custard. Bill, I’m going to run up to church to light a candle for world peace, I will say, and head over to Good Times. The orange stain above my top lip when I get home gives me away every time. 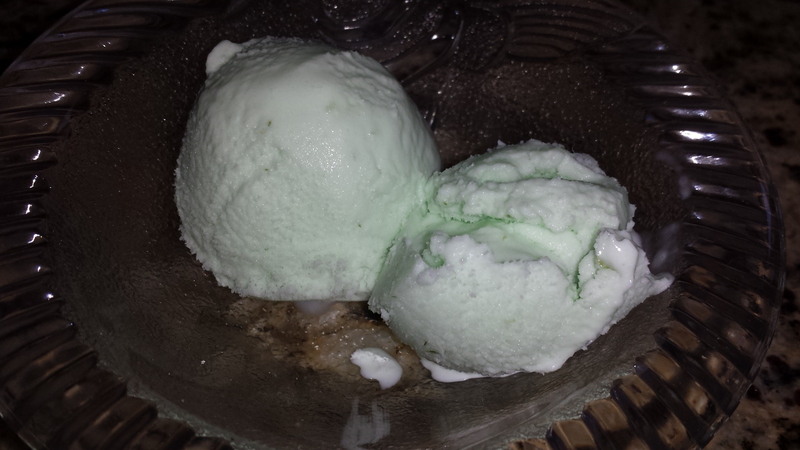 Instead of orange, however, Kaiya and I made lime sherbet. Mylee was too busy playing with Play Doh. Through the process of finding a recipe, I learned that the difference between ice cream and sherbet is that sherbet uses half and half or milk as opposed to heavy cream. Oh, and fruit of course. I dug out my ice cream maker for the first time this year. We mixed together the four ingredients and set the ice cream maker in motion. Thirty minutes later, we had ourselves some lime sherbet. Zest and juice the limes. Combine zest and juice with the half and half and the sugar. Pour it all into an ice cream maker and freeze according to ice cream maker directions. When frozen thick, serve right away or transfer to a plastic container and place in freezer until ready to serve. Nana’s Notes: To be honest, next time I make it, I will add more sugar. It is very tart, which grown-ups are supposed to like. I, however, like my sherbet to be sweet. I like most everything to be sweet. Also, the recipe doesn’t call for any food coloring. But Kaiya was very sad that the sherbet was so, well, not green. So we did add a few drops of green food coloring. Please don’t call the Pure Food Police. Cheese Danish as Mylee envisions it. You might remember that a few weeks ago, Mylee was Student of the Week, an honor which eventually goes to each kindergarten child throughout the year. It is basically a Show-and-Tell on steroids. While in the spotlight, she was asked by her teacher what she wanted to be when she grew up. Much to my (and I think her parents’) surprise, she said she wanted to be a chef. Well, then. The other day I was driving her home from school. It was just Mylee, as Kaiya had her first-ever Brownie meeting. 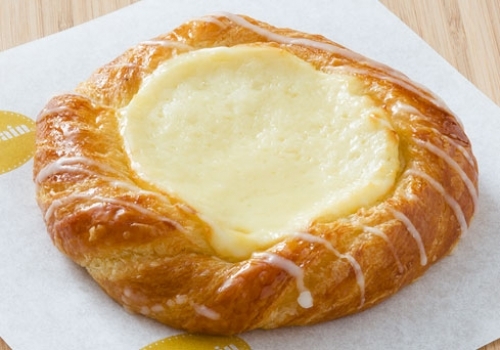 As we drove home, I mentioned to her that I had taken Cole to get a cheese Danish roll at Starbucks, and that he ate it just as she did — cheese filling first. I went on to tell her that I thought I might try and see if I could make cheese Danish myself. I swear she said, “Got it?” I nodded, because she’s the boss. I was pretty sure my recipe would be a bit different than that. And, in fact, it was…..
Unfold 1 sheet of puff pastry onto a lightly floured board and roll it slightly with a floured rolling pin until it’s a 10 by 10-inch square. Cut the sheet into quarters with a sharp knife. Place a heaping tablespoon of cheese filling into the middle of each of the 4 squares. Brush the border of each pastry with egg wash and fold 2 opposite corners to the center, brushing and overlapping the corners of each pastry so they firmly stick together. Brush the top of the pastries with egg wash. Place the pastries on the prepared sheet pan. Repeat with the second sheet of puff pastry and refrigerate the filled Danish for 15 minutes. Bake the pastries for about 20 minutes, rotating the pan once during baking, until puffed and brown. Serve warm. Makes 8 Danish rolls. Nana’s Notes: DO NOT USE WHITE BREAD FOR YOUR DANISH ROLL DESPITE WHAT MYLEE SAYS! Got it? I cut the recipe in half and made only four Danish rolls. I’m going to hear a collective gasp from many of my readers – not the least of which will come from both of my sisters – but I don’t particularly buy into the notion that birth order largely affects one’s personality. I’m sure birth order – like many things – impacts the way one sees life. However, I think that there are so many variables involved that you just can’t say unequivocally that he or she is that way because of placement within the family. For one thing, any time I read anything about birth order, it talks about first-born, middle child, and youngest. That implies all families consist of three children. So since I am the second of four, I guess that makes me a middle child, and so is my younger sister. And yet I assure you that she and I are not alike in very many ways. Mom always did like her best. In my family, my brother is the youngest. Supposedly that makes him a free spirit, a risk taker, and charming. Now once everyone who knows my brother stops laughing at the notion of Dave being a free spirit, stop to think that he is the only boy in what was a traditional family. So, despite being the youngest, he had a lot of responsibilities that his sisters didn’t have, particularly when it came to helping Dad in the bakery. On the other hand, I’m pretty sure Mom made his bed every day (and if not, I will soon hear about it from him). Having said all of the above (implying that I, too, am an amateur psychologist), I will tell you that where the birth order supporters get it right is when it comes to the first-born. Nearly every first-born that I know has many of the same characteristics – they religiously follow rules; they are born leaders; they feel responsible for, well, everything in the world; and they see things as black or white, right or wrong, real or imagined. I love first-borns and am delighted to let them take over my world. 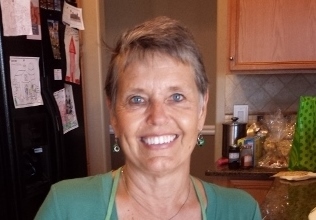 Because I have three sets of grandkids, I obviously have three grandkids who are first-borns. I am not able to observe Joseph on a day-to-day basis, but when I’m around him I can easily see that he has a strong sense of the way things are supposed to go. When they don’t, he feels responsible. (His younger brother Micah agrees – Joseph is responsible!) 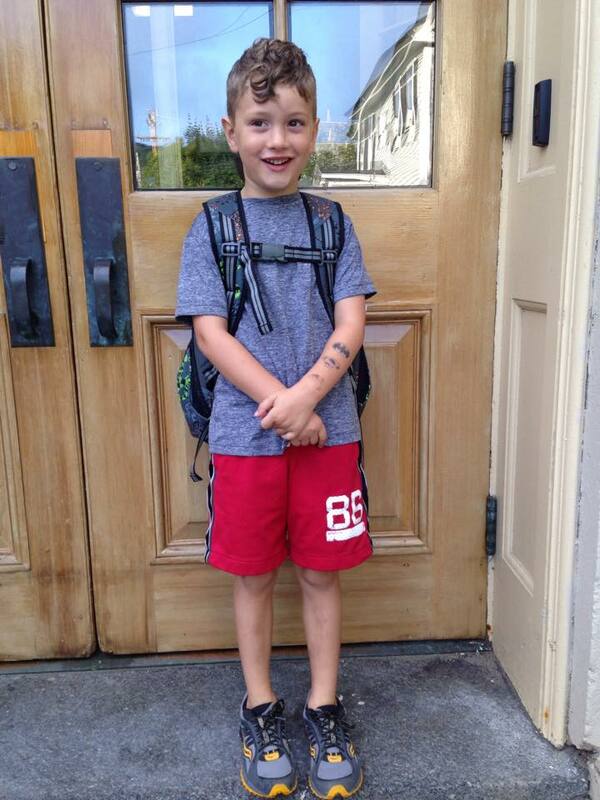 He is a sensitive kid, often bearing the woes of the world on his shoulders (when he isn’t sharing his sweet grin). If you look up first-born in the dictionary, you will see Addie’s picture. She is responsible for everyone and everything. She is self-confident, ambitious, and successful. She knows what is right, and tries to make sure everyone toes the line. In fact, sometimes when she is visiting with her siblings and her brother is not behaving as she would like, she will begin disciplinary procedures. I gently remind her, “Addie, I’ve got this.” She looks at me as though she is thinking, “Well, you may think you’ve got this, but you don’t got this very well! Kaiya is a bit of a different story. She is actually not a first-born, having a brother who is 14 years older. Still, she has a lot of the characteristics of a first born since she for all intents and purposes plays that role in the family. Kaiya notices everything, and has a strong sense of the way things are supposed to be. She is the one who notices if I’ve changed something in the house. She doesn’t hesitate to let me know that I really should have left well enough alone. I recently got a new cookie jar. I bought it primarily for the color, which goes well with my new kitchen colors. Etched on the cookie jar are the words Fresh Homemade Cookies. 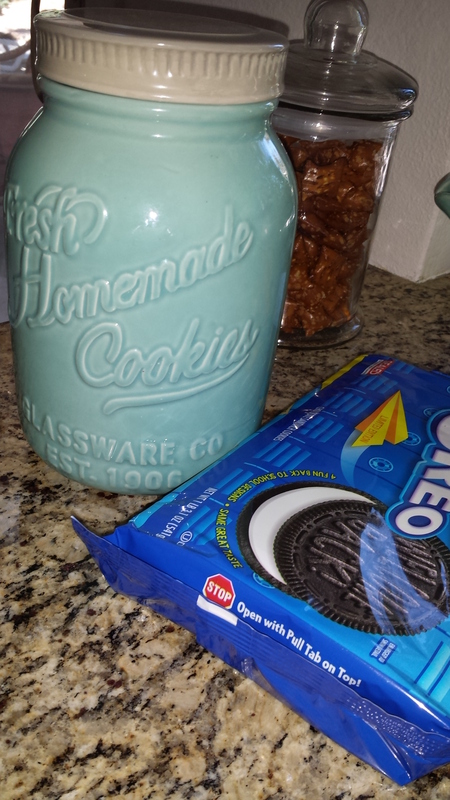 For the most part, the cookie jar contains Oreos, because that is the cookie of choice for ALL of my grandchildren as well as their grandfather. But ever since I bought that cookie jar, Kaiya has told me I shouldn’t have the Oreos in that cookie jar because they aren’t homemade. 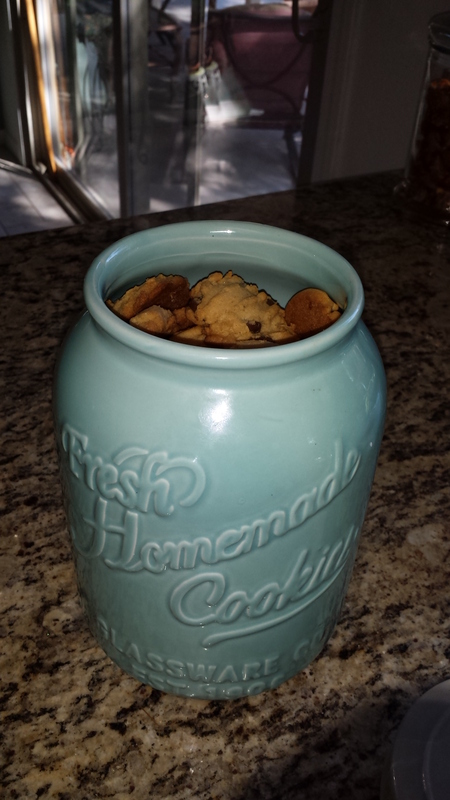 “Nana, you need to make some homemade cookies to put in that cookie jar,” she recently instructed me. 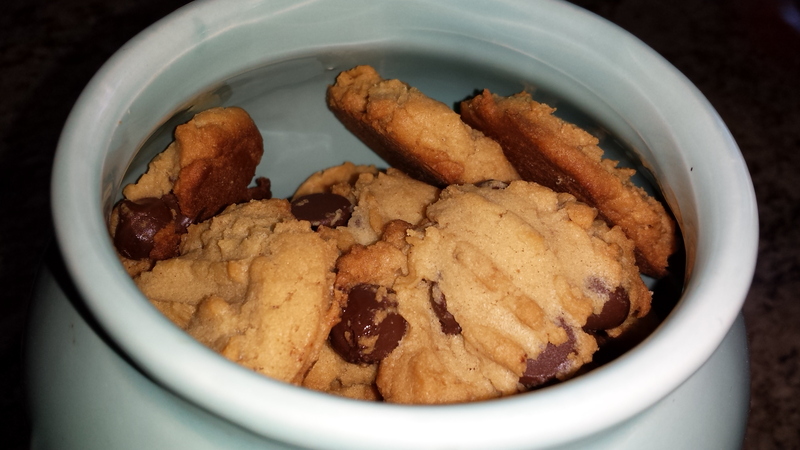 Well, birth order or not, I did as she instructed and made some homemade peanut butter chocolate chip cookies. That should keep all the first-borns in my life at bay for a bit. In a large bowl, cream together butter, granulated sugar and brown sugar. Mix in peanut butter, egg, and vanilla until combined and creamy. Add flour mixture to sugar mixture, and mix until the dough comes together. Add chocolate chips and mix until combined. Drop by rounded tablespoons or form into 1-inch balls onto a greased baking sheet, leaving about 2 inches between each cookie. Press each cookie with the back of a fork to give it the classic peanut butter cookie look. Bake for 11-12 minutes, or until the edges are just beginning to turn brown. Cool on the pan for a couple of minutes before placing them on a rack to cool.